The Belleek anniversary vase features an embossed round tower along with a harp and wolfhound. 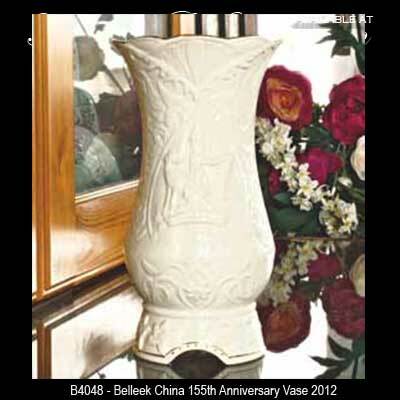 The Belleek anniversary vase is the 2012 annual pieces. Each piece has its own individual number and a special limited edition backstamp. The familiar and world-renowned Belleek trademark of the round tower, harp and wolfhound along with shamrocks and the word Belleek has been recreated in relief pattern as the main feature of the front of the 155th anniversary vase. The Belleek vase measures 5 1/2" x 10 1/3" tall. The vase is handmade in Belleek, Ireland and it is gift boxed with a shamrock history card that is complements of The Irish Gift House.